Power supply for Ultimaker 2 and Extended, also compatible with the + versions. Pulley pack for Ultimaker 2 and Extended, also compatible with the + versions of those machines. The Bowden set for Ultimaker is composed of the Bowden and the clips to attached at both ends. The Olsson Block is a complete kit to attach to your Ultimaker 2 so you can change the nozzle easily and quickly. 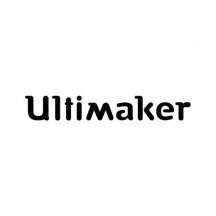 Reserved for Ultimaker experts only. The Olsson Block nozzle kit is a pack of 3 nozzles only compatible with machines equipped with the alternative 'Olsson Block' nozzle block. Comprises two 0.4mm nozzles and a 0.4mm steel nozzle for printing abrasive materials. Power supply for Ultimaker Original compatible with the Original + version. The product doest not contain the plug, only the power supply. The set contains all axis for Ultimaker 2 and Ultimaker 2+, including the X/Y and Z axis with motor + the slider blocks. Bearings set / pack for Ultimaker 2 machines, compatible with all 3D printers. Contains everything to change ball bearings. Pack of fans for Ultimaker Original. This spares pack is original and produced by the manufacturer. Only compatible with Ultimaker Original. Brass nozzle, diameter 0.25mm, for Ultimaker 2(+). When changing the nozzle, it is recommended that you do it hot. Nozzle sold individually. 0.80mm diameter brass nozzle for Ultimaker 2(+). When changing the nozzle, it is recommended that you do it hot. Nozzle sold individually. Stainless steel nozzle, 0.50mm in diameter, for Ultimaker 2(+). When changing the nozzle, it is recommended that you do it hot. Nozzle sold individually. Spare brass 0.4mm nozzle for Ultimaker Original and Original+. Sold individually. Enjoy the improvements to the Ultimaker 2+ with the new feeder, interchangeable nozzles and new clips for the plate. Installation is simple and only takes an hour thanks to the demo video. Your prints will be better-quality and easier to make. PTFE Teflon insulation for Ultimaker 2 3D printer. Only compatible with the Ultimaker 2 + versions. Temperature sensor for Ultimaker 2+ and Ultimaker 2 Extended+ to indicate the temperature on the printer’s motherboard. Sold as a spare part. Brass nozzle, 0.40mm in diameter, for Ultimaker 2(+). When changing the nozzle, it is recommended that you do it hot. Nozzle sold individually. This glass plate is only compatible with the Ultimaker 2 Go. It helps support printed objects and diffuses heat from the heating plate. Sold as a spare part.